Mass Extinction Incandescent light bulbs…Dont Believe The Hype? Posted January 25, 2011 by Norburn Lighting and Bath Centre & filed under Energy Saving, In The News, Regulation And Bylaws, Uncategorized . Lots of media attention and ensuing hysteria has been generated on the reported ban of the incandescent light bulb in BC. Misinformed pundits and poorly researched reporting suggest that the much loved edison type A standard issue bulb is being banned, discontinued,confiscated and erradicated Don’t Believe the Hype! ,the incandescent bulb is not disappearing any time soon! Although they are not being banned in British Columbia, unlike some places in the world (Europe), they will be replaced by incandescent lamps that will appear very much the same but will be more energy efficient. 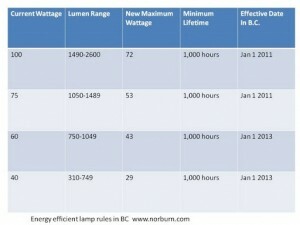 The rest of the Canada, like the USA (except California), will not begin replacing their incandescent bulbs till 1st January 2012, so this means there maybe a brief period when some lamps are difficult to source this year. First on the list of lamps to be affected are the 100w and 75w A19 clear, white and frosted lamps, the 60w and 40w versions will be affected on January 1st 2013. The aim is to make incandescent light bulbs more energy efficient by reducing the amount of power they consume but still giving the light output we expect. This is called the lumens per watt ratio or in other words light bulbs must produce the same amount of lumens (brightness) for less energy (wattage). These new energy efficient versions are not available yet but soon will be. 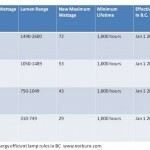 Below is a chart from the American Lighting Association (ALA), which Norburn is a member. It outlines a guide to what you will start to see on the shelves in the future.